That is a loss of 7.8 lbs of fat in 30 days. Don’t know if the other 4 lbs is muscle or other lean body mass. And I’m not sure how accurate my scale is on BF. I use it mainly for trend data and the trend is down. The book said men would lose between 12-20 lbs of fat. I didn’t do that anyway you look at it. One thing to take into account is I weight 220 just a few days before starting the diet. I lost 4 lbs before starting, which I’m sure was mostly water. So the water weight you lose at the beginning of a diet was already gone when I started. If you add that 4 lbs of water weight in, I lost 15 lbs, which would be accurate. Either way I’m happy. My weight is down and I don’t feel like I’m on a diet. I go through ups and downs on eating the food, but mostly its is fine. I can keep this up for a long time. I’ve decided when I hit 198 I’m going to take a day off and eat crap. French Fries, Bread, Ice Cream Candy. Then I will puke and go into a sugar coma. 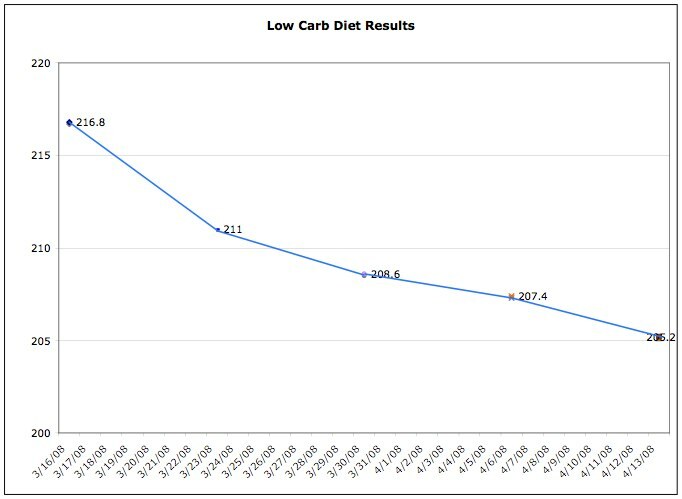 Then I’ll go back on the low carb is keep going down. I had this belief in my mind that I used to – like in the last year – struggle right at 190. Couldn’t go down, but didn’t rise much over that. Well I caught up entering all my weights for the last few years into my excel spreadsheet and here are the results. As you can see I haven’t been under 195 in two years. I’ve been riding the 200 mark for awhile. And the trend line shows a steady increase as I age. I need to watch this.